It has been a little while since I’ve gotten around to doing this. And I hope you did, too. PFF used their unique system to conclude that the Vikings offensive line was ranked 25th in the NFL last season. They ranked last in the run game and fifth in the pass game. After publicly ripping Sidney Rice for not making it to Larry Fitzgerald’s camp, Cris Carter explained why Brett Favre doesn’t need to go to Training Camp. I wish I would have thought of this. That guy over at the Viking Ship is a genius. Lemke’s Lot took a stab at predicting the Vikings 53 man roster when September rolls around. Remember that old trick question: “What day do the British celebrate the 4th of July?” Well, apparently it isn’t a trick. Who knew. Tarvaris Jackson is okay with Brett Favre missing training camp which, as Vikings Nation points out, is an opinion that probably couldn’t matter less. When there is a list of the most annoying people in sports, you know that Brett Favre is going to be on it. But where does he rank? Click here to find out. Brett Favre apparently thinks LeBron shouldn’t have dragged out his decision making for quite so long. Did a recent waver claim improve the roster in an area of need? Some people think so. At the Daily Norseman, there are a number of questions being raised about the upcoming season. That number is five, to be exact. John Clayton of ESPN thinks that the production of the Vikings O-Line is one of the top questions facing this team in 2010. As long as Cris Carter is being discussed so much in the last 24 hours, I thought I’d include this article about how he is helping the enemy (or, more accurately, the guy who may have to try and cover Sidney Rice twice a year). Brad Childress has a chance to meet up with his son while on the USO Tour. Mike Wobschall of Vikings.com reminds us to keep an eye out for more rookie signings in the next couple of weeks, and predicts that no rookie will miss any time at camp because of a contract dispute. 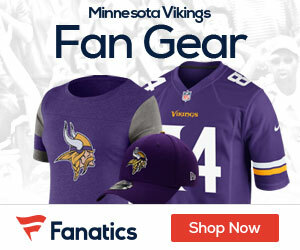 Want to get free tickets to Vikings Games? Want to be on the field when the team runs out of the tunnel? Then learn how to play the drums. PJD has a bit of fan fiction for you all [WARNING: Adult Language. Seriously, don’t click the link unless you like, say, Tom Green] in which Jared Allen declares war on Iran for their recent banning of the mullet. Our buddy Coolio takes a look at the 18 game season. Speaking of Coolio, anyone else notice he managed to infiltrate the pages of the Viking Age? Speaking of the Viking Age… they picked up on a fantastic quote from Jared Allen. It was recently decided that the 1969 Vikings was the best team in their history. My guess? They’ll have to amend that decision after the 2010 season! Want a chance to compete with yours truly for the crown of biggest hack on the net? Here’s a great chance. Has Brett Favre made some of his teammates incredibly rich? See what I’m saying about our OL now? If you can’t get Adrian Peterson big time rushing yards, you just are not doing your job. Standing pat here is not a good move. BTW, LeBron James just made quite a mess of his image and the entire NBA image as well. One man’s opinion here is that it was a complete fiasco of handling an already awkward situation. Don’t care really, but somebody should be embarrassed. LeBron, David Stern, Cleveland owner, ESPN, plenty of it to go around. BTW, Brett Farve just made quite a mess of his image and the entire NFL image as well. One man’s opinion here is that it was a complete fiasco of handling an already awkward situation. Don’t care really, but somebody should be embarrassed. Brett, Roger Goodell, Minnesota owner, ESPN, plenty of it to go around. Freds, if I didn’t know better, I could draw the conclusion you were mocking my post. But like I said, I know you would never do that, so I have officially taken your post as a compliment. At the same time, the irony which you pose here is not lost on me, although I do believe that LeBron’s actions were more offensive than the Wrangler’s. Besides, he’s a Vike now, he gets more slack than an egotistical basketball player from another city who snubbed his own hometown. Mornin Coach, the L.James thing was/is terrible, I just wanted to see some baseball hi-lites last night. Thats all they would talk about. Anyways, I believe we now stand at 62 days to the start of the 2010 seasson. Yes, 62 Ed White days. Tom Green?? Awwwww … I was shooting maybe more for like Louis C.K. The o-line was definately overrated last year and the stats back it up. The area that needs the most attention is getting the least help. i find it interesting favre called out lebron like that. kinda cool though. Denny Green must be just flipping his lid about now!! Fred feels bad for the sheriff. Anyone see this story?! WTF?! Thats bad stuff. Maybe this will straighten him up. Ok fellow purple people, we are now 61 Wes Hamilton days away from opening kickoff. Thats not really that long.